I am deeply moved as I speak to you in your University today, in this town where, during the years of slavery, a Greek School flourished. At that time we spent together stony years, years of persecution and of death, years of suffering. Freedom remained hidden like embers smouldering in the souls of your forefathers, and of the Greeks who lived here with you and thanks to your hospitality. In those years learning was a rare good and the price to be paid for it was high, sometimes with persecution, sometimes even with one’s own life. Those years have left memories deeply engraved, as if by a penknife, on the marble of our hearts. May our address today be considered a homage to the memory of your forefathers, who wrapped the Greek School in the cocoon of their affection. In my address to the University of Craiova the other day I raised the issue: what do we mean by the assertion that Europe is a creation of Christianity. 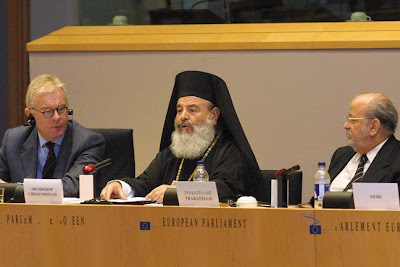 I showed, within the limited time span provided for a speech, that Christianity has contributed very significantly to the creation of the European, thanks to the fact that it offered him and her the identity of equal participant to a different kind of commonwealth, namely the respublica christiana, constituted by common faith, a shared perception of justice and common learning. As a matter of fact, before Christianity, the term “Europe” denoted merely a geographical concept, it signified merely one specific region. At first, it was the name of an area of Greece, also known as Epirus . The first geographer, Hecataeus from Miletus used the term Europe to denote the region which extends from the embouchure of the river Danube to the Iberian peninsula. The term Europe is found for the first time in a text by Sulpicius Severus of the 4th century AD, no longer as a geographical concept but as a unitary formation: after expressing his admiration for the ascetics of the East, the Roman chronicler adds that “our Europe too has found its place in the economy of salvation by means of its saints”. However, more centuries had to go by before Christianity could triumph, more work needed to be done before Europe could be formed as a distinct entity. Around 950 AD, the Byzantine Emperor Constantine Porphyrogenitus speaks of Europe with the pride that one has when one speaks of one’s own homeland: “It is reasonable that Byzantium should be at the head of the land called Europe, given that it is a city both reigning over and surpassing the entire world”. And he adds confidently: “Indeed, I regard it as the head of Europe because Byzantium itself is the most beautiful and most honourable part of Thrace”. There was therefore the growing realisation, during the Middle Ages, that Europe constituted not only an area but our home. Yet, in times of threat or of conflict, difference presents itself to us and our identity becomes evident. It is not at that moment that our identity comes into existence for the first time, as has been claimed, but rather that it presents itself in relief. This is how we can explain why Europe fully realised its particular essence only with the appearance of the threat of Islam. Nowadays, it is claimed by certain thinkers and politicians, who strive to shake off the heritage of Christianity, that, in any case, identification of Christendom with the European spirit occurred, if at all, only in the Middle Ages, and that Europe, being a creation of the Renaissance, has nothing to do with Christendom. And yet, with the same confidence as that of Constantine Porphyrogenitus, whom we quoted earlier on, Pope Pius II remarks in 1458 that Islam “turns against Europe itself, which means against our homeland, against our own hearth”. Let us be reminded at this point that the year 1458 was High Renaissance, and Pius II, before becoming a Pope, was one of the representative literati of that movement, Aeneas Silvius Piccolomini. In 1623, another characteristic representative of the Renaissance, Francis Bacon, used the expression “We Europeans” in his writings, and of course he must have felt that what he wrote was something which the people around him shared with him. Yet maybe no one else expressed this identity so well as the great cartographer Abraham Hortelius, who, in his “Geographic Encyclopedia”, noted in 1578, under the headword “Christian”: “For Christian, see European”. One cannot help wondering: if Hortelius’ 16th century is not the Renaissance, where are today’s antichristian members of the European Parliament striving to discover the Renaissance? Needless to say, the European landscape was not an integral whole in which the Christian Church worked towards the goal of the entry of that whole into ― and its unification within ― her own ideal of a regime. Sadly, the European landscape was torn by deep seismic chasms. The Church, as a historic presence, could not always remain aloof or operate at a distance from public sentiment. She could not always keep herself out of the pressures of secular power. Particularly in Western Europe, the Church herself developed into a distinct authority, thus breeding a disastrous anti-ecclesiastical spirit. In this way, although she fought to create a society of solidarity, an ecumenical republic, where all nations would live in peace and security, the Church herself found herself scheming breaches or collaborating in their occurrence. Every man and woman of the Church feels deep grief for everything that the Schism between Rome and the Orthodox Church has been causing for centuries now. I do not mean specifically the Schism of the year 1054. The Schism was there well before, and in a number of different ways. Its consequences, however, did not consist only in endless theological feuds or, as has been said, “disputes between priests”. The Schism brought disasters upon the peoples of Europe and still continues to traumatise them in their historic course. I do not think that up to this day there has been written a sincere and penetrating history of all the evils caused by the Schism to the Church, and to the life and culture of Europeans. Nevertheless, it is certain that, once this history is written, it will help us all realise how mortal a sin the Schism has been. I shall not refer here to the ecclesiological aspects of the Schism. Instead I shall concentrate strictly on the subject of my talk, but let me just remind you that it was the Schism, both during its period of incubation and when, later on, it came out of the snake’s egg, which led to the pernicious division of Europe into Eastern and Western world, to the underestimation of and contempt for the one of these two worlds by the other, which, in turn, ended up in wars and disasters. The division of Europe into two worlds began precisely with that gap between Byzantium and the West. The Westerners called themselves Europeans, as if the other peoples were not. However, the state, the head of which would always sign as “King and Emperor of the Romans”, was not designated by anyone as Byzantine, or Byzantine Empire, until only as late as 1562 by Hieronymus Wolf in Germany. And it was with great satisfaction that I noted the desideratum pointed out by an eminent historian of our days, namely that Byzantium should be reintegrated into the history of Europe. We must also acknowledge the fact that this state was the first Christian commonwealth of Europe, founded upon Roman law and Greek learning. In this sense, Byzantium was the founder of Christian Europe. Within the framework of the Byzantine Empire, the Church was able to teach the ecumenical idea. Although invasions and settlements of peoples did occur within the empire, and despite the fact that massive displacements of populations from one region of the empire to another were not uncommon, we have no indication of ethnic strife: the Church treated all peoples with the same love, and took care of the integration of any newcomers. But this could not be so in Western Europe. Being preoccupied with the acquisition of secular power, the Church of Rome was unable to teach the peoples the principle of peaceful mutual acceptance. Thus, already in the course of the early Middle Ages, the texts of the period make mention of the inextinguishable hatred between Italians and Germans, and particularly between Franks and Germans ― a hatred that caused many conflicts in the course of the centuries, before leading to the two World Wars. The original Schism between the Orthodox Church and Rome was followed by others, of which the most serious was the breach between the Catholic South and the Protestant North. The religious wars which ensued caused new wounds to the body of Europe, and led to its inner division. It is significant that the Western European was abandoned by the Church, and as a result he turned the blessed love of one’s own homeland into ideology: Nationalism, this deadly enemy of the peoples of Europe, is an offspring of the Western world, an offspring of a Christian world which grew up without being taught the ecumenical spirit by the Church, along with the love of homeland. It is a valuable lesson for us all, how, in the midst of war, groups of national resistance, in which Christians participated, set themselves the task not only of crushing Nazism, but also of surpassing the hatred between the peoples. Accordingly, while the Resistance was fighting against the Germans, at the same time they were organising post-war Europe demanding its re-unification, so that even the German opponents could partake of it on an equal basis. Their demand was accepted by other personalities of the Resistance and led to the Declaration of the Resistance Convention of Geneva on May 20, 1944, in which anti-Nazi Germans participated as well. The courage of those people, their strength to struggle for freedom with no need for nationalist hatred, is a luminous example for us all. At this point I shall claim, if I may, in homage to their memory and in appreciation of their struggle for the freedom and dignity of their own compatriots and of all Europeans, that those people found themselves at the head of the quest for the Christian commonwealth. In spite of the anathemas and the enmity, by the grace of the Lord, the great and catastrophic Schism never materialised to the fullest extent. If the Church, in her historical dimension, had allowed herself to remain trapped in the Schism, then Europe, as a formation of the Church, would have ceased to exist. It is impossible to know whether the hordes of barbarians would have become states or whether they would have remained what they still were by the time they were baptised or what they continued to be for centuries in Asia: that is, violent hordes, plagues of injustice and pillage, brave but inhuman. For Western Europe, the baptism of the Frankish leader Clovis, first barbarian king, in 496, was indeed a decisive development of historic significance. It was from that point onwards that the integration and europeanisation process began for the barbarians. For the Orthodox world things were different, since the Roman tradition adopted by Theodosius consisted in striking one’s enemies for as long as they fought, but also in integrating them in its world as soon as they would calm down. If the Church in her historical aspect had remained trapped in the Schism, then Europe would have died even before being born. This is because the Church of Rome, despite her secular aspirations, did not cease to uphold the Corpus Juris Civilis, namely Justinian's Law, in the course of the centuries and to put it across as a model. By this means she succeeded in teaching the barbarians that the law is more important that the state, since the latter is founded upon the former, and that the law does not die when the sovereign dies, not even when the state dies. In brief, she succeeded in teaching the sovereigns that they could only contravene the law, but they could not fail to acknowledge it ― the sovereign was about to learn that going against the law counted as a sin even for him. In this way, the Church of Rome pushed the barbarians to establish “Christian States” after the model of the Roman Empire and to bow to the sovereignty of the rule of law. If the Church in her historical dimension had remained trapped in the Schism, then Europe would have been given no breathing space, because communication between its two “worlds” would have been interrupted and hindered to an extent until then unseen by man. But communication was there. Greek was always regarded as the “lingua sacra”, knowledge of Greek was always a proof of sound education and the so-called “missa graeca” never ceased to be chanted in the West. There was a sufficient number of grammars of Greek. Greek manuscripts were collected by all important monasteries and great libraries. The educated of the Middle Ages had ways of communicating and collaborating with one another despite the Schism. As a result, Greek learning never ceased to be seen by the West too as a desired ― if not so common ― good. "Greek letters taught, even when they were absent", as an eminent master noted . Yet may it be that Christianity, though the creator of Europe once, is now in the past? What does it have to offer to Europe today, now that there are no more barbarians, at least not in the historical sense of the term? What can it offer to this Europe which navigates by the stars of human rights and of the rule of law, and where education is compulsory up to a certain age and then open to all? But the Church is to the world what the soul is to the body: she is the breath of life to it. She is the expression of God’s love and of His gift to man, the open and caring embrace of the Virgin Mary, the life of her members itself, their prayer in joy and in grief. As an institution, as an organisation, the Church expresses her ecumenical standing by covering the life of man in its entirety. There is no social task which the Church undertakes because the state does not want to or cannot carry it out or because there are no other capable institutions. The Church constitutes by definition the very fact of our life in community. She cares for us because we have our own cares and we come to drop them off at her. The Church will not forfeit her social work, because we only think of going to church when we want to pray for someone or for something. The intervention of the Church is therefore our own warm breath on the frozen glass of necessity. As the troparion says, “the Church proved herself to be like a sky studded with many lights, which illuminated all the faithful”. It is within the horizon of the Church that we raise this issue today. And we can see wherein the threat lies today. Without Christianity, the United Europe will not become a society but a company. It will be unable to develop into anything more than a well-organised group of people, connected between them only with the frosty logic of the rights of the individual. In Christian society, human relations are governed by the wealth of the soul, and it is only when this latter has become exhausted that we resort to the law. In contrast, in a company the law stipulates the nature and the manner of the relations so that the whole may be maintained in order, so one is then left with the impression that one’s self develops as one thinks fit. I wonder, how much loneliness will be needed before we realise that the development of personality outside the blessed society is precisely what is described in the Parable of the Prodigal Son? Without Christianity, the common framework of values, which we all share, will be abolished and replaced by the private sphere. Our ethics will no longer be able to determine human rights, but will be determined by them. I wonder, how much pain will be needed before we realise that the rights of man are not the way for man to live, that man lives if and only if he does service, that he is happy only when he gives and offers, because he too then becomes the recipient of an inexpressible gift, and therefore man’s greatest right is to waive his own rights, to be able to go constantly beyond them. Without Christianity, spiritual life will be pointless, and will be identified with entertainment, with pleasure and with rest. I wonder, how much pain will be needed before we realise that a spiritual life which is not in constant contact with exercise is no real recreation but flabbiness and futile words? And what situation need we come to before we see that what should be a great offering and rejoicing of the spirit, has deteriorated into gratification? How far down need we fall before we open our eyes at last to see that, without devotion and sacredness, voluptuousness is affliction, and enjoyment is a deadly sword? Without Christianity, man will turn into a producer and, by the same token, a victim of consumerism. I wonder, how much deprivation will be needed before we realise that, without days of fasting and abstinence from desires, man is tied to the chariot of the ever and deliberately growing needs? How many tears need be shed before we learn to see that, if man cannot feel the distinction between days of retirement and days of feast, then he will only enjoy himself like a pig in its own dirt? Without Christianity, the United Europe will not be a civilisation but an enlarged marketplace. It will be nothing but a rearing farm of a greasy, grey shapeless mass. Europe has been our vision. It is now up to us to create the United Europe, and not the united cowshed. We do not ask that all Europeans be Christians. Religious tolerance is also our own request, not just a request of non-Christians. We do not ask that the Church should direct the State. The independence of the State from religion is also our own request. What we do wish for is that the face of Europe be not lost; that we not wreck Europe by throwing it away into irrelevance through its civilisation, its languages, its traditions. The Church does not ask for anything, she does not act like a corporation. The Church is anxious; the Church is praying. 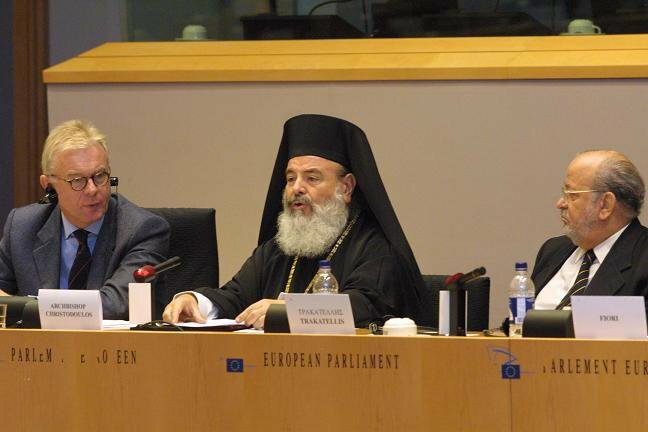 And I would like to share with you the prayer for Europe not to be deprived of our Christian future. I wish to share with you the prayer for our fight for the unification of Europe to turn out to be not a sin but a blessing.